Rex should get used to feeling pressure this season. NFL Training camp season is always a time for irrational exuberance. Every team thinks it can win the Super Bowl, even though 31 of those teams will end being horribly wrong. And so, to preview the upcoming NFL season, which could be the most unpredictable ever, we now give you five reasons why your favorite team could win the Super Bowl. Today, it's the New York Jets. 5. Rex Ryan: Greatest Coach Ever. The man, the myth, the legend. 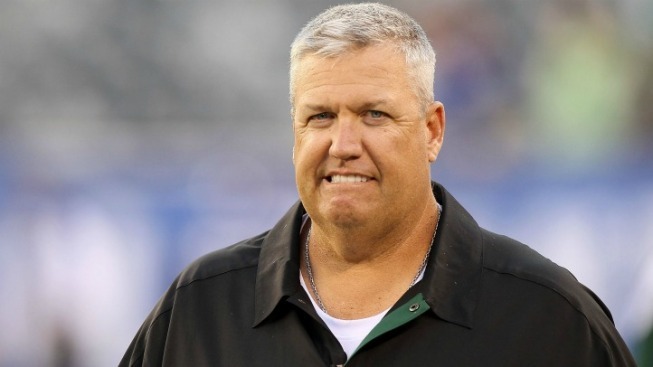 Rex Ryan is like a walking steakhouse. He's gotten this team to two straight AFC title games with Sanchez learning on the fly, and there's no reason to think he can't do it again. In fact, this is the team I picked to win the Super Bowl this year. And really, what BETTER omen could you want for your season that some uppity blogger picking your team because he doesn't want to pick New England? GREAT THINGS AWAIT YOU, JETS FANS.